PISO FARE friends, check your travel bucket list for 2018! Here is an exciting airline seat sale for trips to both domestic and international destinations! Booking for this seat sale is up to August 31, 2017 or until seats are available. Promo tickets are great for travel on March, April and May 2018. Yes, this promo is just perfect for your summer getaways with family or friends. Check the List of Holidays and Long Weekend for 2018. Grab Cebu Pacific promo fares as low as P799 for flights to local Philippine routes from Cagayan De Oro, Cebu, Davao or Zamboanga. From Manila, fly to several places in Luzon and Visayas for only P1,499 or P1,799. Manila trips to Mindanao cost P2,299 per way. Planning for a vacation to foreign countries? International promo ticket starts at P1,299. This is for flights to Guangzhou or Xiamen. 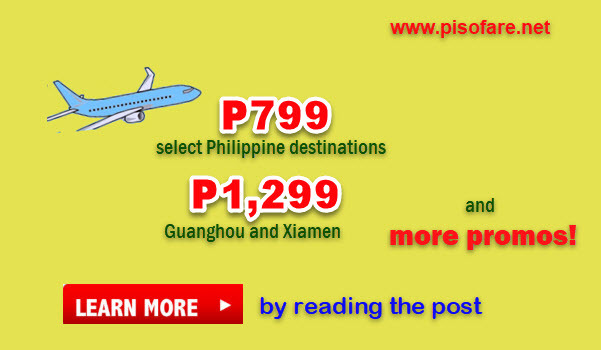 Visit Hong Kong, Taipei, Brunei, Kota Kinabalu, Singapore or Macau for only P1,799. Affordable fares are also available to other Asian destinations, Sydney and Dubai. Tickets on sale are LIMITED and subject to seat availability! Book fast to avail the lowest fare! Good for one-way trip, the sale tickets of Cebu Pacific Air cover the base fare, Web Admin Fee, taxes & fees and free 7 kilos hand carry bag. As there is no checked baggage allowance included in Cebu Pacific tickets, you may purchase a Prepaid Checked Baggage Allowance during booking or up to 4 hours before your flight departure thru the Manage Booking tab of the airline website, calling the reservation hotline or the sales offices. Cebu Pacific Prepaid Baggage options to choose from are: a) Small or up to 15 kilos; b) Standard- up to 20 kilos; c) Large, or up to 30 kilos, and d) Extra Large- maximum of 40 kilos. 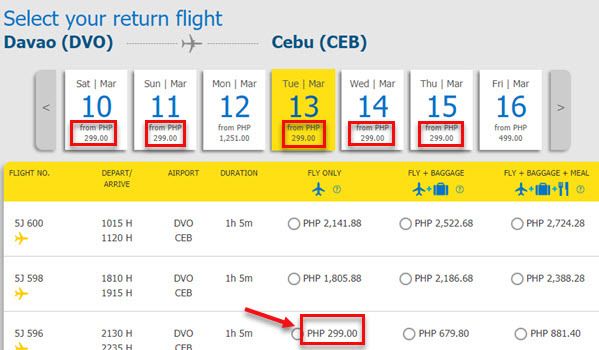 Avail the promo fares by booking online at Cebu Pacific website. Log-in at www.cebuapcificair.com, select your departure city (from), your destination (to), departure and return dates and number of passengers you will be booking. 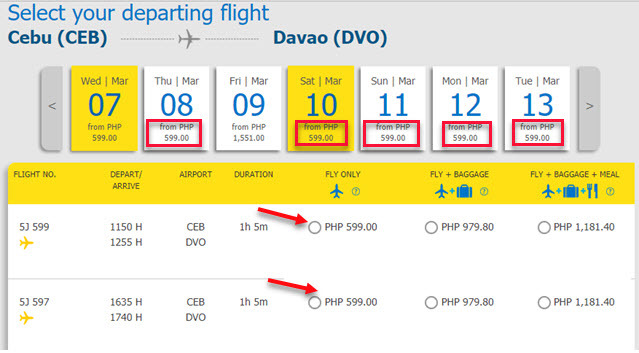 Read this Cebu Pacific ONLINE BOOKING GUIDE for more details. Another way of getting the low fares is by buying tickets at the Cebu Pacific Sales Offices, booking and travel agents. Calling the airline reservation hotline to book ticket is another option in getting the promo fares. Are you interested on this sale where you can get cheap fares for your summer vacation? Then, boom or buy tickets the soonest possible time. Promo fare are LIMITED, First Come, First Serve! For more Cebu Pacific, Air Asia, Philippine Airlines promo fares 2018, PISO FARE 2018, LIKE and FOLLOW our Facebook page: PISO FARE TICKET!!! good evening ask ko lang po if yung promo po na manila to bacolod kung yun po talaga price niya 1,499 kahit ano pong oras? As of now walang promo for your route. Please like our Facebook page so you can receive notification on promo updates. Thank you. Hello ,May I ask if you have promo flight fron narita to manila.April 20.2018 one passenger only. hi . i just want to ask if you have a promo ticket going to ozamis or pagadian in mindanao from manila . 1 ticket only for senior citizen . pls notif me asap . He want to book next week . I just wanna ask if there is a promo Manila to Dumagute or Dumagute to Manila..